Shalom Aleichem: To Sing or Not to Sing? This week’s parasha, Vayak’hel, begins with God’s command for Israel to observe the Sabbath. 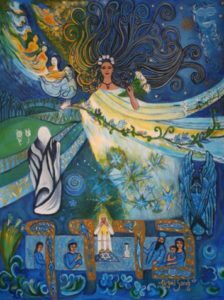 One of the most famous symbols and songs of Shabbat is undoubtedly Shalom Aleichem, traditionally sung before the evening Kiddush. The lyrics of Shalom Aleichem welcome the Sabbath angels into our homes, and for many, serve to set the atmosphere of Shabbat itself. Yet, some of our wise rabbis in the past have cautioned against singing this song! Where did Shalom Aleichem come from, and who composed it? When did Jews start singing this song, and why? Much of the beloved Kabbalat Shabbat service is of very recent origin. 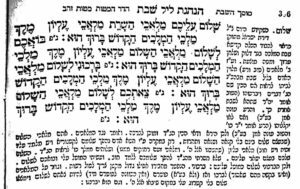 For example, Lecha Dodi, through which we welcome in the Sabbath, was composed by Rabbi Shlomo HaLevi Alkabetz (c. 1500-1576). In fact, the eight verses of Lecha Dodi form an acrostic, the initials spelling his name. Born in Greece, Rabbi Alkabetz later moved to Tzfat, the capital of Jewish mysticism. 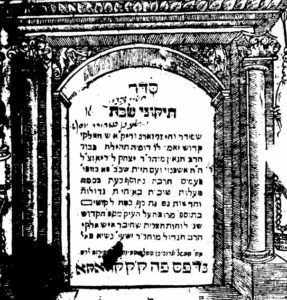 He studied with Rabbi Yosef Karo (c. 1488-1575), famed composer of the Shulchan Arukh, and was the brother-in-law of the Ramak (Rabbi Moshe Cordovero, 1522-1570), who led the Tzfat Kabbalists before the arrival of the Arizal (Rabbi Itzchak Luria, 1534-1572). Many practices and customs of Judaism as we know them today originated in this incredible circle of Jewish mystics in Tzfat. One of these is the Kabbalat Shabbat prayer service. And when you come home from the synagogue after praying Arvit, stand at your place at the meal table, and say “This is the meal of the Holy Apple Orchard”… and after this, encircle the table around the right, silently. 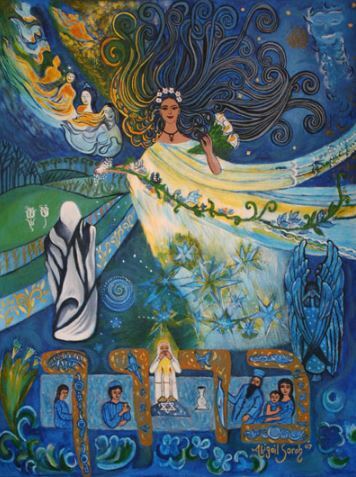 Then, take in your hands two bundles of hadas [myrtle branches], and join them together, and say the blessing [besamim] on them, and smell them. And afterwards, encircle the table a second time with the branches in hand, silently. Then say “Zachor v’shamor b’dibbur echad ne’emru”. Then say Kiddush. After eating the meal, recite some passages from the tractate Shabbat, then birkat hamazon, then say again “Zachor v’shamor b’dibbur echad ne’emru”. Then say the blessing on the hadas a second time. In the morning, for the second Shabbat meal, do the same as you did the previous night [during the first meal], and do the same for the third meal [seudah shlishit]. Thus, while we find some words that remind us of Lecha Dodi, such as “bo’i kalah” and “zachor v’shamor b’dibbur echad” (rearranged by Alkabetz in Lecha Dodi so that “shamor” comes first, to spell his name “Shlomo”), there is no mention of an entire Lecha Dodi. Nor is there any mention of singing Shalom Aleichem (or Eshet Chayil for that matter). The Arizal did teach that one should say the words “shalom aleichem” three times at the end of Birkat Levanah, the blessing on a new moon recited once a month (Sha’ar Rosh Chodesh Chanukah v’Purim, ch. 3). This is still done today. The Arizal explained that saying shalom aleichem three times serves to remove any kitrug, spiritual “prosecution”. Based on this, some believe that whoever composed the song Shalom Aleichem incorporated this teaching of the Arizal. This is probably why some (especially Sephardis) have the custom to sing only the first three stanzas of Shalom Aleichem, thus saying the words “shalom aleichem” three times. Alternatively, this may be why many others (especially Ashkenazis) have the custom to recite each stanza of Shalom Aleichem three times. So where and when did Shalom Aleichem first appear? 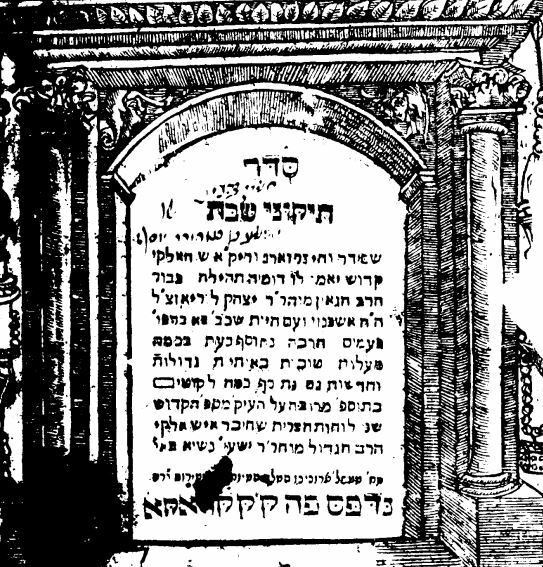 It seems the earliest source is Seder Tikkunei Shabbat, a work first published in Prague in 1641. I found a 1650 Krakow edition, and its Kabbalat Shabbat service and meal table ritual is nearly identical to what is generally practiced today. There are the six Psalms before Lecha Dodi, then Lecha Dodi itself, followed by two more Psalms. Then there is Shalom Aleichem, with all four stanzas—each to be read three times—followed by a prayer called Ribbon Kol HaOlamim, and then Eshet Chayil. The cover page of the text says it is based on the teachings of the Arizal. It isn’t clear who exactly put the book together, though it appears to mention a “Rabbi Isaiah Nasi”. That may be Rabbi Isaiah Horowitz (Shelah HaKadosh, 1555-1630), a renowned Kabbalist who was born in Prague and lived for a time in Krakow. He got hold of the teachings of the Arizal, and towards the end of his life travelled to Tzfat in hopes of learning directly from the Arizal’s disciples. Considering that Seder Tikkunei Shabbat was first published twenty years after the Shelah left Europe, and eleven years after he died, it may have been put together by someone else, based on his teachings, which were in turn based on the Arizal. Still, we do not know who it was that composed Shalom Aleichem. Whatever the case, within a century it had become popular enough that there were those who opposed singing it. One of these opponents was Rabbi Yakov Emden (1697-1776). He published his own siddur, where Shalom Aleichem is missing. He pointed out several issues with the song, including the absurd request for angels (and not God Himself) to bless us (although earlier Jewish works don’t necessarily have a problem with this), and the strange wording of the song, especially the word “mimelekh”. Amazingly, modern versions of Rabbi Emden’s Beit Yakov siddur do include Shalom Aleichem! 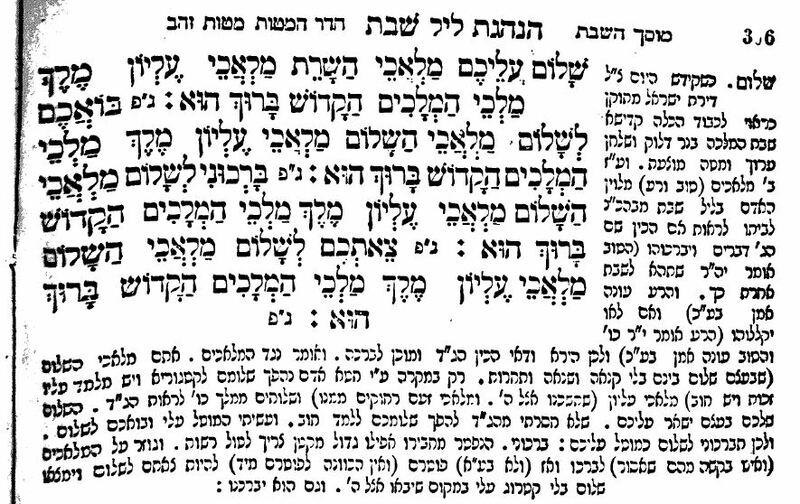 The earliest Beit Yakov siddur I could find was from 1881, which has Shalom Aleichem in full, though without that problematic word mimelekh. It is these angels that Shalom Aleichem is apparently referring to. The angels are welcomed into the home, asked to give us their blessing, and to head back out. We see above that one of the angels is a kategor, a “prosecutor”. As we learned from the Arizal, saying shalom aleichem three times eliminates kitrug, “prosecution”, thus neutralizing that “bad” angel. As for the argument that the song is requesting blessings from angels, I believe the second argument regarding the strange wording of mimelekh actually serves to neutralize the first argument. This line is meant to remind the singer and the audience that, of course, we are really just request a blessing from God Himself—through His messenger angels (something that happens many times in the Torah)—hence the words “From the King of Kings, the Holy One, blessed be He” (מִמֶּלֶךְ מַלְכֵי הַמְּלָכִים הַקָּדוֹשׁ בָּרוּךְ הוּא). We are welcoming the angels that are coming are way mimelekh, “from the King”, and who are blessing us mimelekh, “from the King”. To summarize, Shalom Aleichem did not emerge among the early Tzfat Kabbalists, nor was it recited by the Arizal as some believe. It had only become widely popular by the middle of the 18th century. The identity of the author remains unknown. So, should we recite Shalom Aleichem, or not? For those who have reservations (like Rabbi Emden, and apparently also the Vilna Gaon) and feel strongly that it should be skipped (or wish to mirror the early Tzfat Kabbalists as closely as possible), they have on whom to rely. However, it is difficult to avoid such a deeply-rooted and widely-accepted custom. Ultimately, the song is based on a Talmudic passage, speaks only of positive things, and affirms God is the “King of Kings”. It is a mystical, albeit mysterious song, and a beautiful, peaceful way to start the Sabbath festivities. This entry was posted in Holidays, Jewish Law & Life Cycle, Kabbalah & Mysticism, Mysteries & Origins and tagged Angels, Apple Orchard, Arizal, Birkat Levanah, Eshet Chayil, God's Names, Kabbalah, Kabbalat Shabbat, Krakow, Lecha Dodi, Prague, Prayer, Pri Etz Chaim, Psalms, Rabbi Chaim Vital, Rabbi Isaiah Horowitz, Rabbi Jacob Emden, Rabbi Shlomo Alkabetz, Rabbi Yosef Karo, Ramak, Sabbath, Sabbath Queen, Shabbat, Shabbat (Tractate), Shalom Aleichem, Shelah HaKadosh, Tzfat, Vayak'hel, Vilna Gaon on February 26, 2019 by Efraim Palvanov. 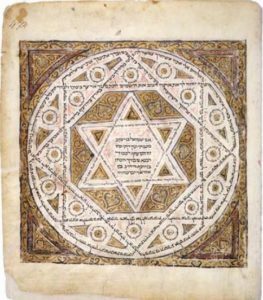 Star of David on the 1000-year old Leningrad Codex (1008 CE). This week’s double parasha is Vayak’hel-Pekudei, which speaks of the Sabbath, the construction of the Tabernacle, and the formal establishment of the priesthood. One of the things described is the creation of the Menorah. This seven-branched candelabrum is perhaps the oldest symbol of Judaism. We discussed in the past how King David had the Menorah emblazoned on his shield (with the words of Psalm 67), and this was the famous magen David, “shield of David”. Yet, strangely, the term magen David today is associated not with the Menorah symbol but with the so-called “star of David”. Stranger still, this hexagram was historically known not as the “star of David” but rather as the “seal of Solomon”! 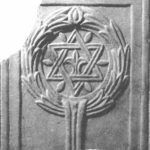 Where did this symbol come from, what is its significance, and how did it become associated with the Jewish people? The hexagram is a relatively simple shape and is found in art and architecture across Europe and Asia. While few ancient synagogues bear the star, many churches do. The most famous synagogue to have the star is the one discovered in 1866 in Capernaum (Kfar Nachum), a village on the Galilee initially founded by the Hashmoneans following their Chanukah victories. This synagogue is actually more popular among Christians, since the gospels of Luke and Mark describe how Jesus preached there. Archaeologists have also found the symbol on the seal of one Yehoshuah ben Asayahu in the remains of the ancient city of Sidon. The seal is dated all the way back to the seventh century BCE. The great scholar Gershom Scholem (see his Kabbalah, pgs. 362-368) pointed out that the hexagram was used by alchemists to represent the fusion of fire (the up-triangle) and water (the down-triangle). This may have a connection to a Jewish teaching on the meaning of the term oseh shalom bimromav, which describes God as making peace in the Heavenly realms. One explanation is that here in the lower world, water and fire are unable to co-exist, while up in the Heavens God is able to unify these opposing forces. This divine power was demonstrated with the seventh plague in Egypt, which was “hail with fire” intertwined (Exodus 9:24). The fact that it was the seventh plague in particular may be noteworthy, since the Star of David has seven parts: the six points of the star and the inner hexagon. 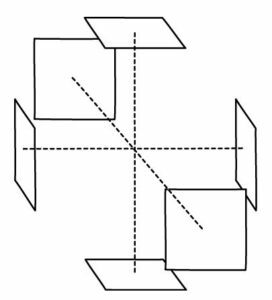 The three axes (x, y, z) of our three-dimensional reality, and the six faces (or six directions) that they produce. 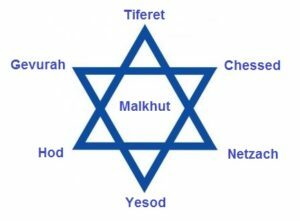 That seven-based arrangement has a great deal of significance in Judaism. It represents Creation, with the six days of the week and the special Sabbath. This itself is a reflection of the fact that all physical things in this universe exist in three dimensions, ie. within a “cube” of six faces, while the seventh represents the inner, spiritual dimension. The same arrangement is found in the mystical Tree of Life, where the lower sefirot are arranged as six “male” qualities and the seventh, “female” quality (Malkhut). Because of this, the Arizal (Rabbi Isaac Luria, 1534-1572) arranged his Passover seder plate in a hexagonal style, with each of the components corresponding to one of the lower sefirot, while the three matzahs correspond to the higher sefirot (Chokhmah, Binah, Da’at), and the plate itself (or the cup of wine) paralleling the seventh and final Malkhut. The Pesach Seder Plate. There is a debate whether the Arizal intended the items to be placed in a star shape, or with two triangles one atop the other. The latter is likely as it more closely resembles the Tree of Life diagram. This arrangement of seven (or more specifically, of three-three-one) is found within the Menorah, too, that most ancient of Jewish symbols. For this reason, some argue that the opinion of the Shield of David having the Menorah and the opinion of it having the hexagram are really one and the same. They both reflect a divine geometry of 3-3-1. 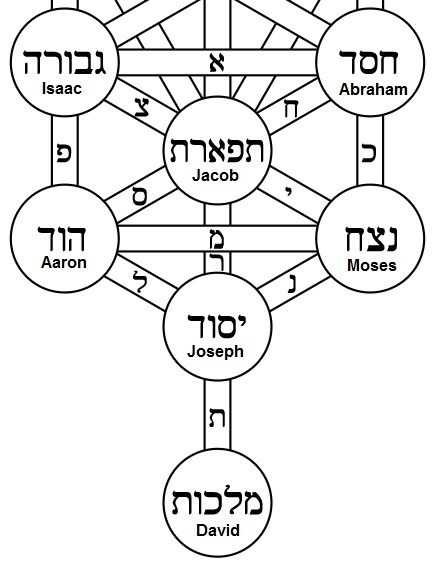 The sefirot are arranged in the same 3-3-1 manner, and corresponding to them are the seven shepherds of Israel: Chessed, Gevurah, and Tiferet parallel the patriarchs Abraham, Isaac, and Jacob; Netzach, Hod, Yesod parallel the next three great leaders of Moses, Aaron, and Joseph; and Malkhut (“Kingdom”) naturally stands for David. David is at the centre of the star, so it is fitting that the star is named after him. The first row of three (called by the acronym CHaGa”T), is followed by the second row of three (called NeHe”Y), and then the singular, “feminine” Malkhut (or Nukva), which receives from all the others. Yet, it isn’t clear when and why the symbol became known as the “Star of David”. Rabbi Yirmiyahu Ullman points out that it may come from the fact that in Ancient Hebrew script the letter dalet has a triangular shape (much like the Greek delta), thus making “David” (דוד) appear as two triangles. Whatever the case, the symbol is already described as magen David, the “Shield of David”, in 14th century Kabbalistic texts, as Scholem points out. However, in those days it more commonly went by another name: the Seal of Solomon. 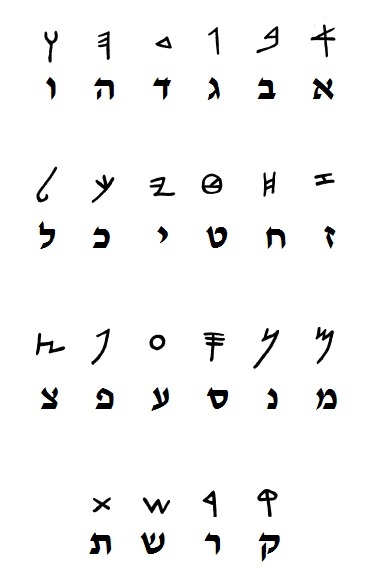 Ancient Hebrew Script. The letter dalet is a triangle. In medieval texts, the hexagram is most commonly referred to as the “seal of Solomon”. The earliest texts that mention it are actually Islamic texts, not Jewish ones. They speak of a special ring that King Solomon had which allowed him to interact with jinn spirits (the root of “genie”) both good and bad. Although the texts are Arabic, they are clearly based on more ancient Jewish teachings. In fact, the earliest reference to a special ring possessed by Solomon which allowed him to defend from evil spirits is in the Talmud. In what is likely the longest story related in the Talmud (Gittin 68a-b), we are told of how Solomon sought to find the special shamir “worm” which would allow him to cut the stones for the Temple without using iron tools. He found the shamir’s whereabouts from the prince of demons, Ashmedai, whom he was able to subdue thanks to his special ring. In an incredible twist, Ashmedai gets a hold of Solomon’s ring and banishes the king from his own kingdom, turning him into a pauper, while Ashmedai himself took the throne impersonating Solomon! Thankfully, this “new” Solomon’s strange behaviour was soon noticed, and the real Solomon eventually made his way back to the palace to reclaim his throne, and his ring. 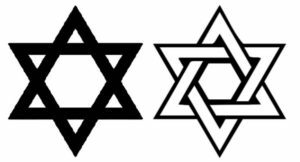 This argument seems to be without any foundation; the two symbols are one and the same, with the Star of David often depicted intertwined and the Seal of Solomon depicted overlapping (sometimes within a circle). 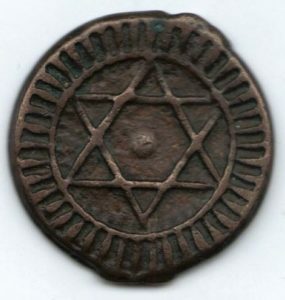 “Seal of Solomon” on a 19th-century Moroccan coin. Gershom Scholem argues that Jews in the 18th and 19th centuries were looking for a unifying symbol to represent themselves, something like the cross of the Christians or the crescent moon of the Muslims. In the city of Prague, the hexagram had been associated with Jews since the 14th century. It was back in 1354 that King Charles IV of Bohemia granted the Jewish community its own flag, with the hexagram upon a red banner. It soon started to appear on the synagogues of Prague. 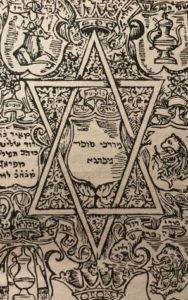 In 1512, the first modern siddur was printed in Prague and, not surprisingly, had the hexagram on its cover. After the Jews’ vital assistance to the city’s defences in 1648, the community was granted another royal flag, now with a yellow star on a red banner. This flag has been used by the community ever since. The timing couldn’t be better (or worse). Just a few years later, the Shabbatean heresy would begin, and Prague was soon one of the movement’s strongholds. It appears that the Shabbateans adopted the symbol and used it in secret to identify each other. Scholem points out that use of the star was one of the reasons Rabbi Yakov Emden accused Rabbi Yonatan Eybeschutz of being a closet Shabbatean (a controversy we have discussed previously). Interestingly, among the Shabbateans the symbol was known as Magen ben David, the Shield of the Son of David, ie. the Shield of the Messiah. This makes sense considering they believed that Shabbatai Tzvi was Mashiach. This isn’t too different from that star-bearing Capernaum synagogue where Jesus supposedly preached. Not too far away from Capernaum in Israel, a 5th century Byzantine church was uncovered, also with the hexagram symbol. Another ancient church in Tiberias displays the star. Perhaps early Christians believed the hexagram was a symbol of their purported Ben David, too! 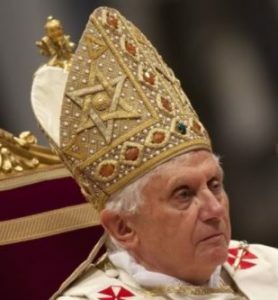 Indeed, to this day one of the Pope’s mitres (the ceremonial hat) has the hexagram prominently displayed upon it. 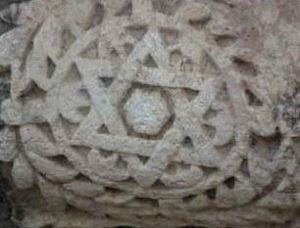 Scholem suggests that the symbol is referred to as Magen ben David in older Kabbalistic texts that predate the Shabbateans (which is where they would have gotten it). Since Kabbalistic teachings date back to at least the Second Temple period, it is possible that even in the time of Jesus there was a tradition of the hexagram being a messianic symbol. In truth, calling it the Shield of David is problematic, since the accepted tradition is that David’s shield had the Menorah upon it. It was Solomon that apparently used the hexagram to shield from demons. And Solomon is literally a ben David, the son of King David, the very first potential Mashiach ben David in history. Mashiach’s role is to reunite all of the Jews in Israel, and to restore the original Twelve Tribes. The twelve vertices of the hexagram are said to refer to the Twelve Tribes of Israel, all reunited as one. Meanwhile, the land of Israel itself is often described in sevens: the seven Canaanite nations, and the seven shepherds to whom it was promised; the “seven species” through which the land is praised, and the seventy names that the land is known by (see Midrash HaGadol on Genesis 46:8). It is therefore most appropriate that the Zionist movement which sought to restore the Jews to their ancestral land chose the hexagram as its symbol. By this point in history, the Star of David was used by Jewish communities and synagogues across Europe and beyond, so it was natural for it to be emblazoned upon the blue and white tallit-flag. 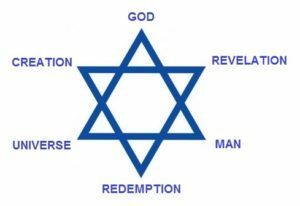 Around the same time, the Orthodox Jewish scholar Franz Rosenzweig (1886-1929) wrote The Star of Redemption, where he used the hexagram to explain the relationship between God and man. Previously, Rosenzweig had resolved to convert to Christianity, then decided to spend one more day as a Jew on Yom Kippur. That day, in a small Orthodox shul in Berlin, Rosenzweig experienced a mystical revelation and an awakening. He became a pious baal teshuva, and a passionate champion for traditional Judaism. His popular “star of redemption” added further meaning to Israel’s new flag. There is one last irony in all of this: the same hexagram was used by the Nazis to degrade the Jews in their attempt to eradicate the nation (likely based on the use of a yellow badge forced upon Jews in some medieval-era towns centuries earlier). To proudly fly the Star of David today is to demonstrate that we are still here, stronger than ever, and we are not going anywhere. We took those stars off of our beaten and bloodied robes and put them on our tanks and jets. And now we await Mashiach ben David, Magen ben David, to come and take command of them. It is, after all, his symbol. This entry was posted in Archaeology & History, Kabbalah & Mysticism, Mashiach & End of Days, Mysteries & Origins and tagged 331, Alchemy, Ancient Hebrew, Arabic, Arizal, Ashmedai (Asmodeus), Baal Teshuva, Capernaum, Christianity, David Wolffsohn, Divine Geometry, Flags, Franz Rosenzweig, Gershom Scholem, Gittin (Tractate), Hexagram, IDF, Islam, Israel, Jinn, King David, King Solomon, Mashiach Ben David, Menorah, Passover, Patriarchs, Pesach Seder, Pope, Prague, Sabbateanism, Seal of Solomon, Sefirot, Shabbatai Tzvi, Shamir, Shield of David, Solomon's Ring, Star of David, Star of Redemption, State of Israel, Symbols, Ten Plagues, Theodor Herzl, Tree of Life (Sefirot), Vayak'hel-Pekudei, Zionism on March 7, 2018 by Efraim Palvanov.